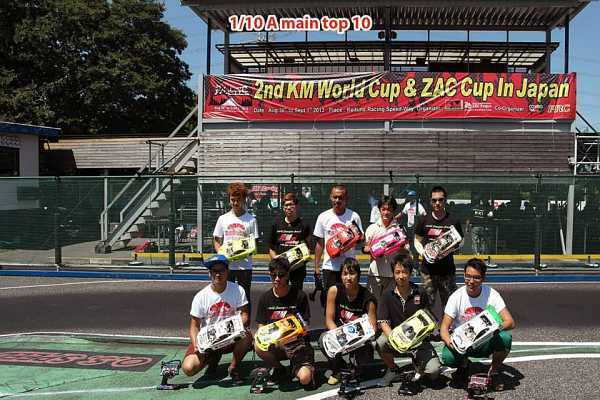 2013 2nd KM World Cup & ZAC Cup In Japan was successfully held! ! ! 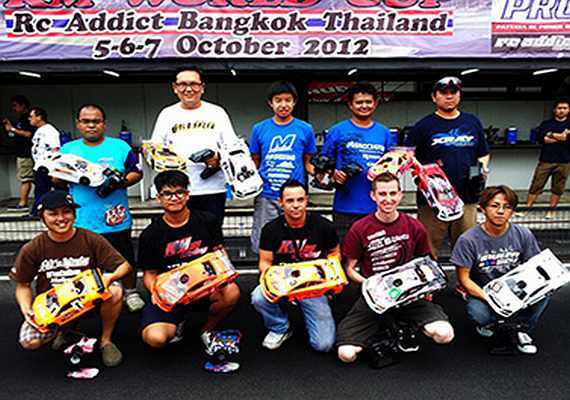 It was a free practise day, we could see all oversea drivers were there running to get the best set-up for next day’s qualify. Local famous Japanese drivers we can see Fukuta, Shimo, Yokoyama, Yuruki and Terauchi also practising. It was not only the KM K8 proto-type 2 was tested by Team KM, but also the HB proto-type R8 was tested by team HB. 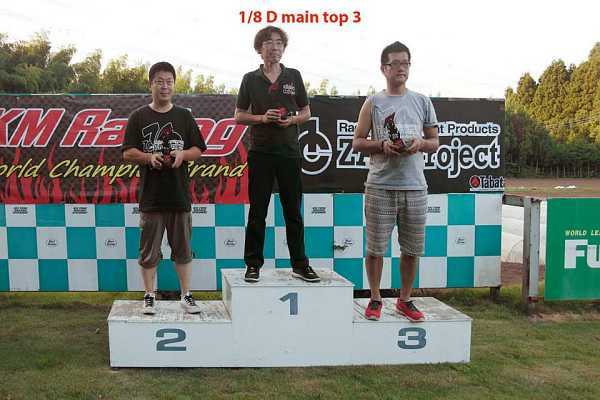 3 rounds of qualifications were held, many local Japanese drivers were attending from Saturday. Openning ceremony was held on Saturday also because there maybe a big storm attacking Japan on Sunday. It was a lucky day since the big storm was attacking all over Japan but only except the Tokyo area, then which made the weather was so hot around 36 degree and around 50 degree on the ground. 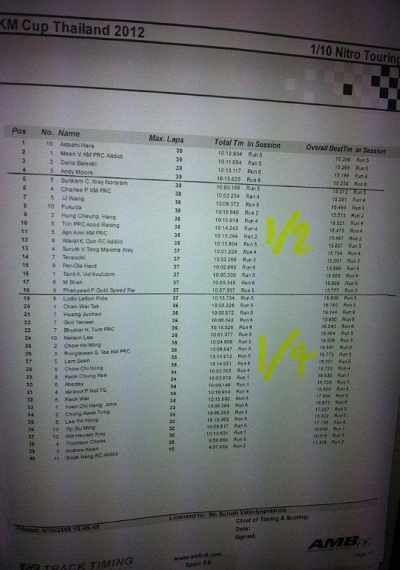 After the morning last round of qualify, 1/10 was TQ by Meen and 1/8 was TQ by Yokoyama. Then it came the final for 1/10, since the mechanic couldn’t hear properly the starting sound, Meen’s car was hitted from the beginning. 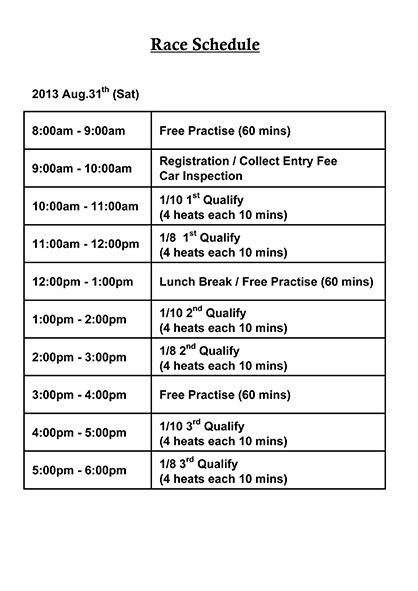 Which leave the new signed Team KM Japanese driver Shimazaki leaded the 30 mins A final until the end. 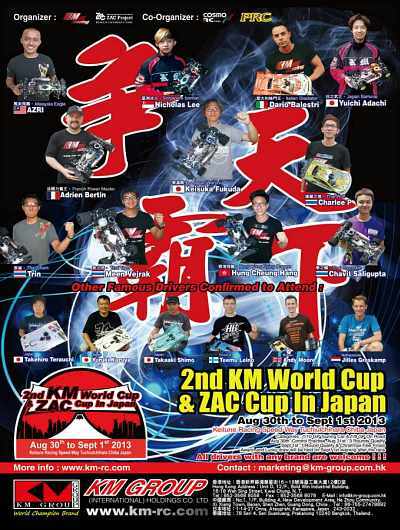 Final result : Champion Shimazaki (Japan), 2nd Hang (Hong Kong) and 3rd Azri (Malaysia), as we can see there were 9 KM H-K1 in the top 10! 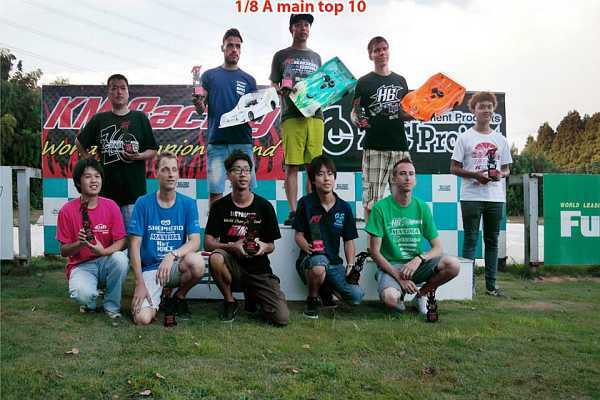 Semi-final 1/8 was started after lunch break and the weather was getting even more hotter, many famous drivers were suffered from engine over heat problems, such as Fukuta, Meen and Terauchi, then they couldn’t bump up to A main but have to race only in B or C main. 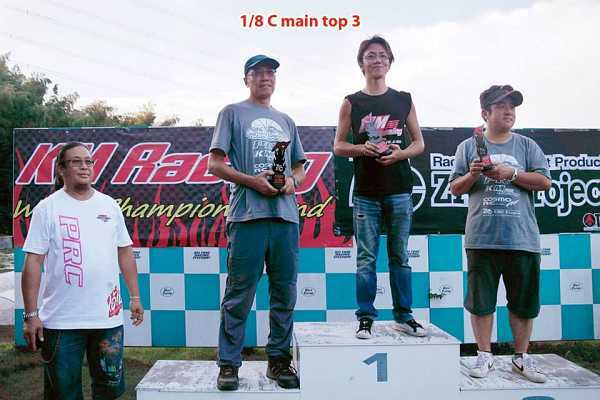 1/8 A final started around 4:00pm, same situation for engine over heat happened to the TQ driver Yokoyama and Jilles and they have to withdrawed the race. Then the final result came as : Champion Shimo (Japan). 2nd Raiola (Italy), 3rd Teemu (Finland). Award ceremony was held right after the race, unique KM tropies was awarded. 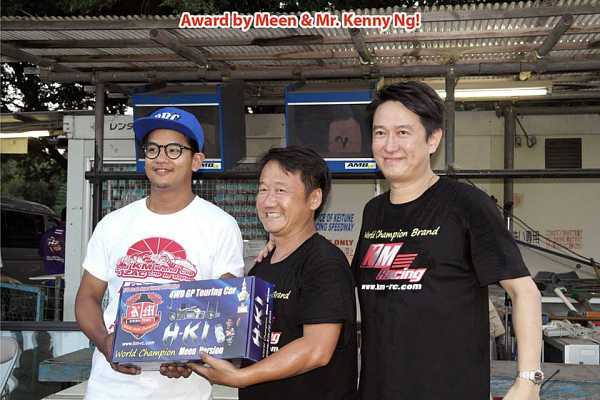 For the lucky draw, total more than 70 gifts were given out and covered all partipants, the final big prize was the H-K1 World Champion Meen Version kit. 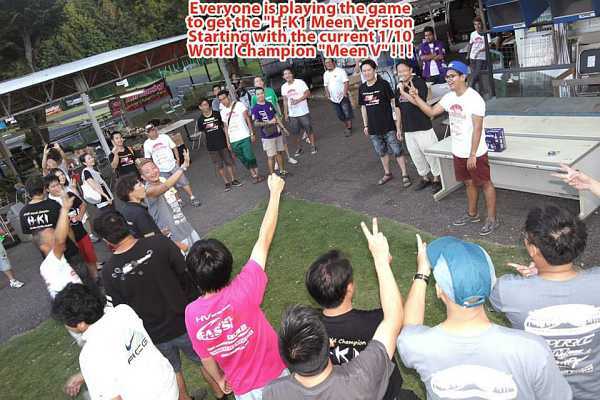 A unique selection was performed by playing game to select the winner for the kit starting with the current 1/10 world champion Meen V againsted the others, final four were againsted each other to decide the winner. 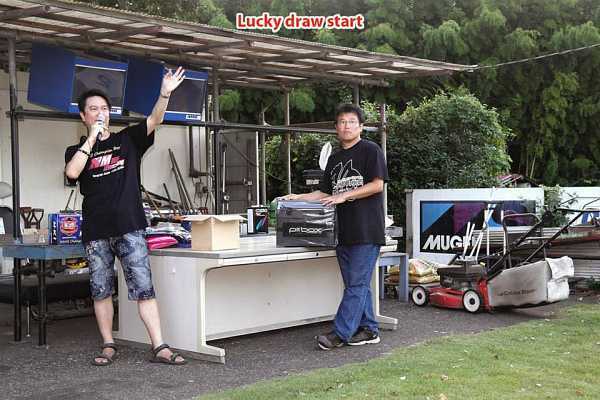 Finally it was Yip Siu Ming from Hong Kong became the lucky guy! ! ! 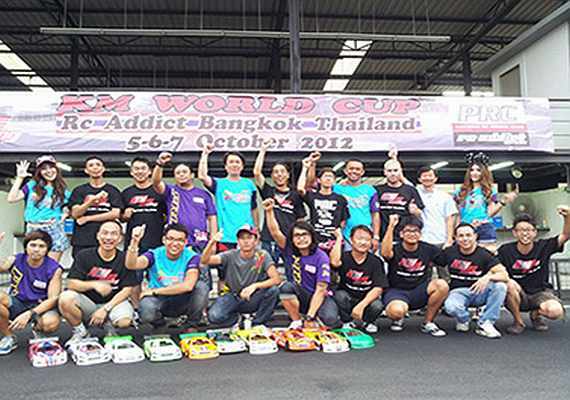 It was very enjoyable race for all the participants and a good last chance practise before the track was closed for the IFMAR world. 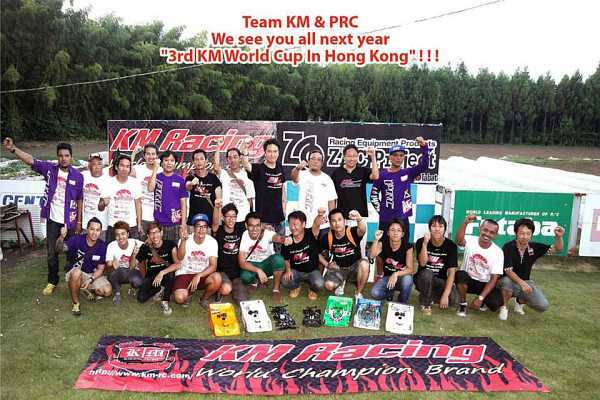 Next year the 3rd KM Wolrd Cup will be moved back to KM racing original city and to be held at 2014, May, in Hong Kong. We wish to see you all here again and let’s Rock’n Fight! ! ! 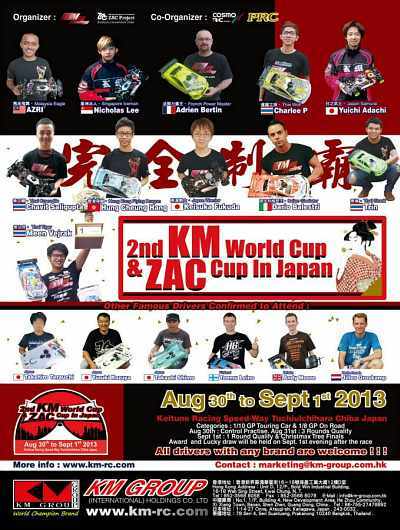 2013 1st KM World Cup In Thailand ! ! ! 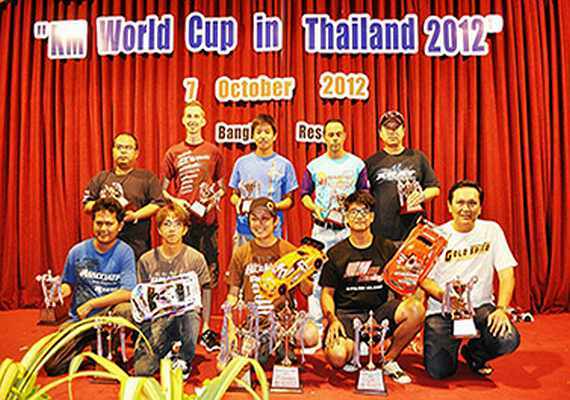 Our 2012 1st KM World Cup in Thailand were successfully held! Oct,5th Friday—we supposed to hold the control practice only on firday,but because the weather report stated that there will be rain on Saturday & Sunday.We decided to run one control practice and two qualify from Friday afternoon. 1st qualify—Three drivers were very fast they were Meen V,Andy Moore and Dario Balestri all of them had 0.2~0.3 sec lap time advantage than the other fast drivers. And Meen took the Q1. 2nd qualify—Again Dario,Andy and Meen were fastest,where Dario performed a super fast lap time of the day with 15.195 sec and lead until the 9 minute.But because in this round his tyre was cutting too thin and almost nothing left then Andy past him and took the Q2. 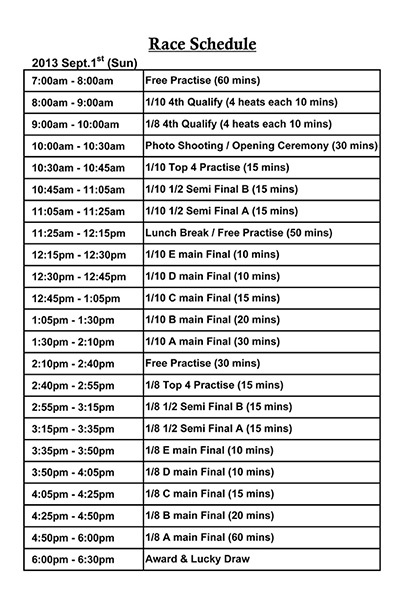 Oct,6th Saturday—Rain came in the morning until noon time,but we could still hold 4 more qualify in the afternoon. 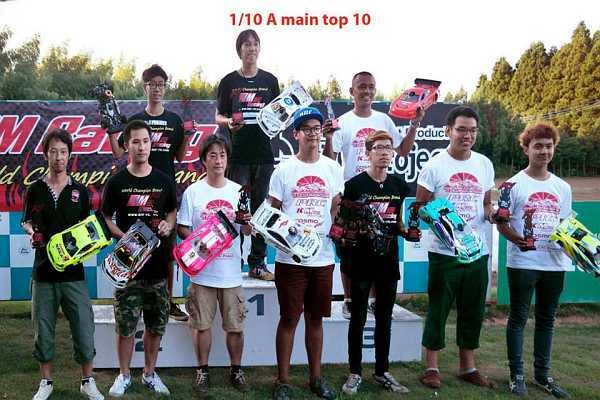 3rd qualify—Astushi Hara came back from south American and start his first qualify,this was not a good one yet for him because he just started.Meen took back the TQ with stable drive where Charlee was doing a very good one with the new engine and stood up at 4 position. Dario was running good again but nightmare came after re-fuel the engine stop because he used a new can of fuel.At this point many drivers suffered same engine stop problems and everyone thought the fuel was the main reason. 4th qualify—Strange fuel affecting Dario’s engine where he suffered engine stop again.Seems same thing happened to Meen and Andy.Charlee took the lead of this qualify and came up to 3rd position.Where Surikarn,Hara and Hang were doing good also and stand up 5th,6th and 8th,also Trin was back to 9th. 5th qualify—In this qualify,Hara,Meen,Surikran,Dario and Andy were very fast because the trackion of the track was the best,they all made their best lap time of the day specially Dario made the best lap 15.186 and which was the best lap time throught out the whole KM world cup race. Unluckily Dario had a little accidient which made him could only finish 3rd in his heat.Battle between Hara and Meen fighting until the end and Astushi Hara took the Q5 with only less than 0.01 sec ahead of Meen. 6th qualify—it was all dark already,Meen couldn’t start at time and Dario took the lead of this qualify with Andy both heated the 39 laps but couldn’t break Hara’s TQ. As the final stand up after 6 qualifications top 4 directly into A-main final were Hara,Meen,Dario and Andy with two KM H-K1 and two HB R10.In the top 10 after the qualify we can see 5 KM drivers where 2nd Meen,3rd Dario,6th Charlee,9th Hang and 10th Trin. But all drivers were very worry about the fuel,which they could all depends on luck if the fuel doesn’t make their engine stop. Oct,7th Sunday—rain again in the morning,we could only start the Christmax tree finals from noon. 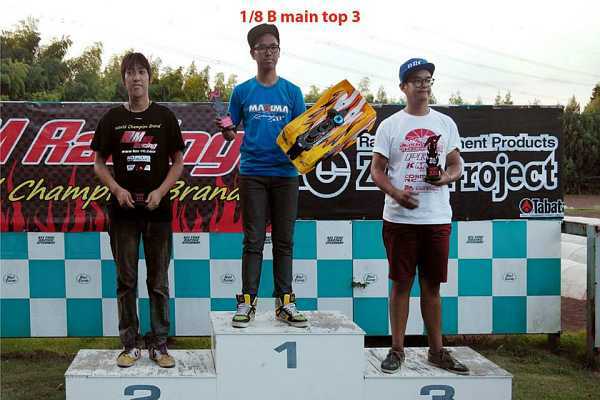 In semi-final B & A,the strange fuel did it’s job and made Charlee frame out and also Azri with a broken engine.For Trin was very unlucky he was lead far of the semi B but since lots of fuel at the exit of the pitlane cause him a big crash to the fence and have to abandon the race.Hang was suffered the trackion roll few times and also engine stop after re-fuel. 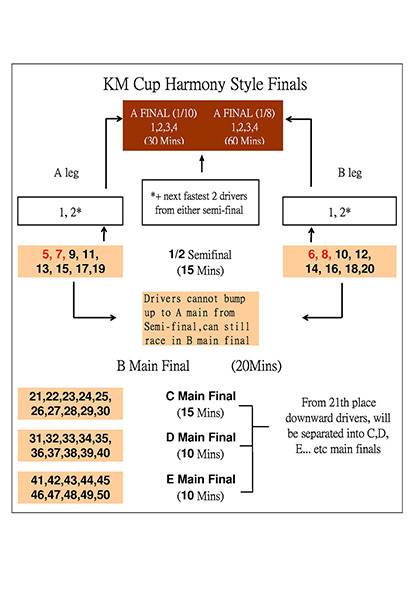 Shower came again after the semi-final,and the A main finalist have to wait until 4pm to start their one hour race. 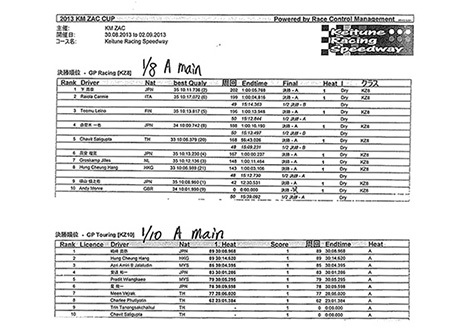 A-	main final—It was a call break time by team Mugen Fukuta before start,in the warm up laps his engine broke down again because of the strange fuel.And the A-main final started after 10 mins. 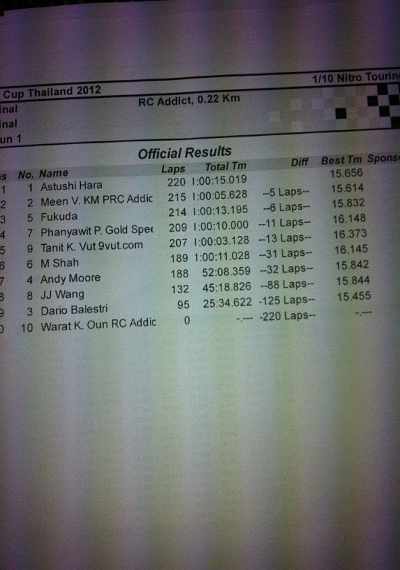 Small accident happened when Meen tried to pass Hara at the first cornor,Meen’s car was flap over but Hara showed his very gentle driver spirit and waited for Meen to pass him again,it was really a good lesson for all RC racers. And Dario took the lead with no competition at all for the first 30 mins,he had passed Hara for his 2nd overlap,but when he came in for the tyre change and re-fuel bad accidient happened to his receiver which broken down after refuel and he had to abandon the race even his was making a long lead and making 0.2 sec faster laptime than the 2nd and 3rd faster drivers.,it was a big disappointment for him. The battle between Hara and Meen went on for the next 20 mins until Meen engine’s glow plub broken down,and Andy Moore took the 2nd position where Meen was still on 3rd after changed the glow plub.bad luck happened to andy after 5 mins because the receiver battery was gone. 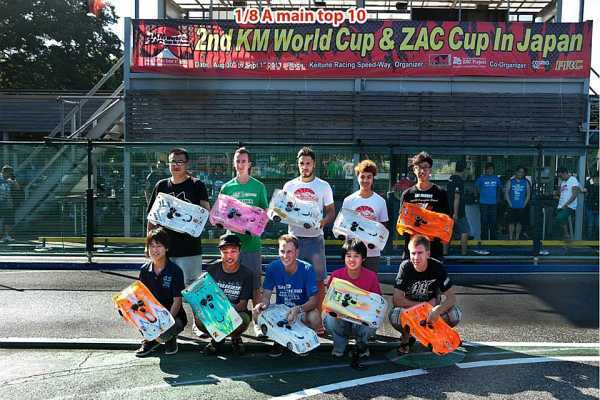 Then Hara finally took the champion title with the HB new car R10,Meen second and Fukuta took the 3rd with his stable drive. Award party & dinner was held in the function hall of K-resort with lots of lucky draws and lots of whisty,all participants enjoyed the race and the night and looking forward to next year’s 2nd KM world cup. 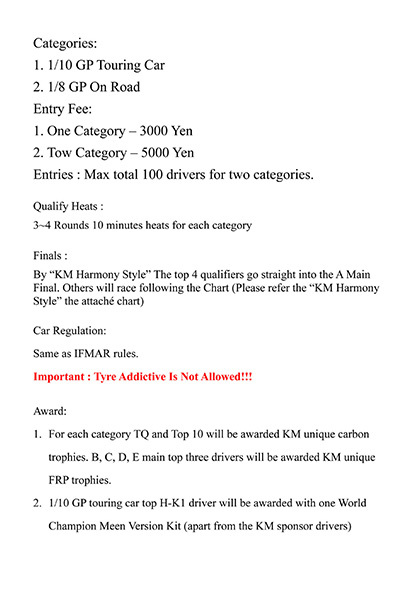 We KM are planning to hold the KM world cup every year,starting from next year 2nd KM World Cup 1/8 GP on road class will be added to chart,both class are open race with any brand’s of car are welcome to join. 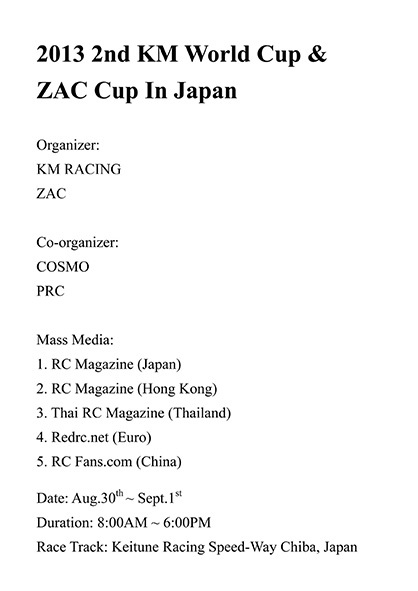 We are still considering the place to hold the 2nd KM world cup,right now we have a few choices to hold at China,Hong Kong.Japan or Malaysia.And we will announce soon about our arrangement.